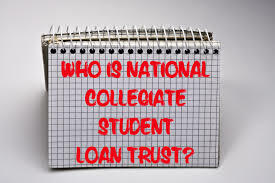 Private student loans, nonfederal loans made by a lender such as a bank, credit union, state agency, or a school, go through the National Collegiate Student Loan Trust (NCSLT) to become investment vehicles. The way the process works is: first a student takes out a private loan from a well-known bank such as Chase or American Express, they are known as the originators; secondly the students loan is transferred to the National Collegiate Funding LLC which is responsible for depositing the loans into the trusts (they are known as the depositor); lastly, the servicer’s role is to collect the money for the private student loan and send bills to the student. The servicer gets paid by the trust that owns the loans. A trust is a separate entity from a company that holds assets for the main company. The investors get paid based on the percentage of students that successfully pay off their student loans. Much like a stock, the more students default on their payments, the less an investor gets paid. This would explain why the NCSLT is thought to be so quick to sue. There is more than one NCSLT and each one is in charge of millions and sometimes billions of dollars in assets. Each trust has within it thousands of private student loans. Even if you did find out that your private student loans were transferred into one of the NCSLT, it is still very hard to figure out which specific trust the loan went in. There is usually a very small paper trail when it comes to private student loan securitization and the NCSLT does not help with this. The NCSLT is said to have some master list that names each loan that is each specific trust, but usually it is not provided unless demanded by law. Along with that, the NCSLT does not show proof of transfers into a trust until it is demanded by law. If a lawsuit is filed against a debtor for not paying they should take some precautions that include: confirming that the NCSLT own the loan and proof of transfer of any student loans to trusts. Also, confirm if the amount owed is correct and if the signatures are correct. Each trust has thousands of private student loans within them so it is difficult to locate one in the plethora of existing trusts.